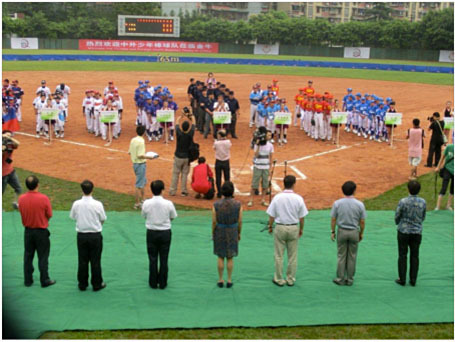 (Chengdu, China) 8 Asian Junior Teams of 11 & 12 Years started the tournament at Jinniu Baseball Fields in Chengdu, China from August 16 to 23, 2012. Baseball Federation of Asia (BFA) and Chinese Baseball Association (CBA), in association with Chengdu Jinniu District People’s Government are hosting the event. Participating Teams are Group Aï¼šChinaã€Japanã€Hong Kongã€Indonesia, and Group Bï¼šChinese Taipeiã€Koreaã€Philippinesã€Pakistan. As a part of endeavors to reinstate baseball to 2020 Olympic Games, IBAF and its member Federations continue to promote baseball to young people throughout the world. IBAF 12U Baseball Championship is scheduled in Taipei, during the summer of 2013.